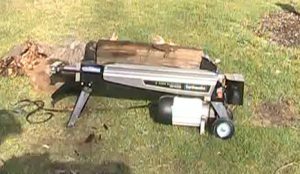 Splitting logs with a log splitter can be very dangerous and in some cases even fatal, so with more and more people every year starting to rely on heating there homes with wood. There is now a higher risk then ever for an injury, so I thought now is a good time to write a guide on how to operate a log splitter safely. After reading this you will find out that it really isn’t too difficult to operate a wood splitter safely, as long as you have the proper protection gear and follow a few simple tips. Most people who use log splitters generally know what they’re doing. So this guide will be a nice refresher for the more experienced, and hopefully a help to the newly initiated. 1 What Protective Gear Do You Need? This is a very simple question to answer since there really isn’t a lot of protective gear that you need and most of it is fairly obvious but I thought I should mention it. The very first thing that you will need will be some kind of protective eye wear, the last thing you want is a random splinter flying from a split log and hitting you in the eye causing damage or worse. I know a lot of people who still won’t use something to protect there eyes because it’s not manly to do so. But I think keeping your eyes protected is one of the most important things when it comes to most things in life. The next important thing to have is either some steel capped boots, or at the very least some enclosed shoes. Some of the logs you will be splitting will be quite heavy and even some of the smaller ones can still cause damage if they drop onto your foot. This is important and should be worn by everyone. The next is some kind of gloves to help handle the wood, while this isn’t the most important thing random splinters and the like can cause people to flinch and drop logs. This is something I have seen firsthand which is why I use some leather work gloves to handle my logs. This last piece is optional but I still recommend it when you’re operating a gas powered log splitter, and that is either ear plugs or ear muffs. Some log splitters can be extremely loud and can possibly damage your ear drums. So while this is optional and situational I would still recommend them to people who have a gas powered log splitter. Even if it is just to help dealing with the noise. One thing you shouldn’t wear is loose fitting clothes or jewelry, the last thing you want is them getting caught in the splitter which be a major hazard. You should always split logs during the day and not at night time, unless you have some excellent lighting set up. It can be very dangerous splitting at night in the dark. Then you need to check the ground you’re planning to split on, you need to make sure it is flat and sturdy land. The last thing you want is your splitter to start slipping when you try to split some logs. Once you have made sure your log splitter is on flat solid land, you should put something heavy in front of and behind the wheels, you don’t want the splitter to start rolling on you. A brick or rock can work. You will want to keep where your planning to split clear of any bits of wood from around your machine, the less mess the better. Once you have cleaned everything away from your splitter and made sure the ground is flat and sturdy, you will want to make sure your beam is locked in. This is a very important step and should never be overlooked. Once you have done that you will want to operate your log splitter from there safe operating zones, which is generally near the control handle. 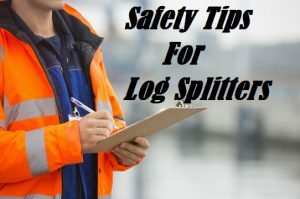 The next thing you will want to do is decide how you want to split your logs, in either it’s horizontal or vertical position if your splitter has this feature. 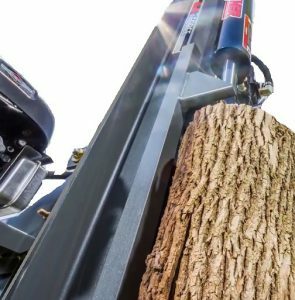 There is no wrong choice here and is entirely up to you which position you like to use, personally I really like splitting vertically since it is less lifting and generally able to split larger logs. To put your log splitter into its vertical position you will need to release the beam lock and lift the beam into the vertical position. You will HAVE to re-lock your beam manually in this position and you MUST do this, otherwise a lot of terrible things will happen when you attempt to split logs. If you want to split horizontally you shouldn’t have to lock the beam since it should do this by itself, but it never hurts to double check. Your control handle should have three setting which are forward, neutral, and reverse. They are all pretty self explanatory but I will go over a brief summary of them all in case. The forward position makes the ram go forward and split the log which will be something you will use pretty often, and once your log has split you should put it into neutral which is like a hand brake for the ram. Once you have split the log you will want to put the control handle into reverse which will bring your ram back. BUT once it has returned to its position you HAVE to return the control handle back to neutral. Leaving it in reverse when it’s fully retracted will damage your machine and you should be careful. The first thing you will want to check is if your wood has been squared off at the end, this will make life easier. Once you have made sure of that you will need to place your log onto your splitter against its endplate, and make sure you have positioned the log against the grain. This next step you will want to be careful, since you will be keeping your hand on the log and operating the control handle at the same time. While this should go without saying I will mention it now, NEVER put your hand at the front of the log or between the log and endplate. You should place your hand on top of the log to just keep it steady. The next step while you’re keeping the log steady is to operate the control handle and put it into the forward position. With that it will make the ram move forward and start to split the log, once the log starts to make contact with the wedge you will need to remove your hand that is keeping the log sturdy. While doing that you will need to be keeping the control handle in the forward position. Once the wedge has split the log and reached the end you should put the control handle in its reverse position to return it back to its starting position. If your wedge gets stuck or only partially splits your log, you will need to put it into reverse, then back into its forward position. This should give it the momentum to get through the log. Once you have split the log and returned the ram back to its starting position you have successfully completed your first of many cycles to come. Just be wary of split logs falling onto your feet!